Squash House Quilts: Our Very Own Barn Quilt and a Treeless Apple! We're back home from our trip. We returned home a day early on Friday. Unfortunately the weather turned way south on us - rain and clouds, so we really didn't want to go fishing. But we did manage to amuse ourselves - more about that in a bit. A very large package and two very happy kitties greeted us as soon as we got in the door. After loving Sasha and Gracie May, we tore into the package. We had eagerly awaited its arrival all week only to find out it would be delivered while we were gone! Our first Barn Quilt! Isn't it pretty? It's called a Wyoming Valley block. I'd never heard of it until now. I loved that it has some of the green in our house! I got it from a wonderful Etsy seller HERE. Sherry is very talented and a really nice person! I don't think this will be the only barn quilt we order from her! I can think of at least two other spots on the house itself that are just screaming for another barn quilt! Do check out Sherry's Etsy site! You'll find loads of designs for a very reasonable price! A treeless apple you say? Yup! I've gone over to the "dark side". Since fishing in the rain wasn't any fun, we decided to spend a day wandering around University Village in Seattle. My little Netbook that I've had for years and years was on it's last legs. 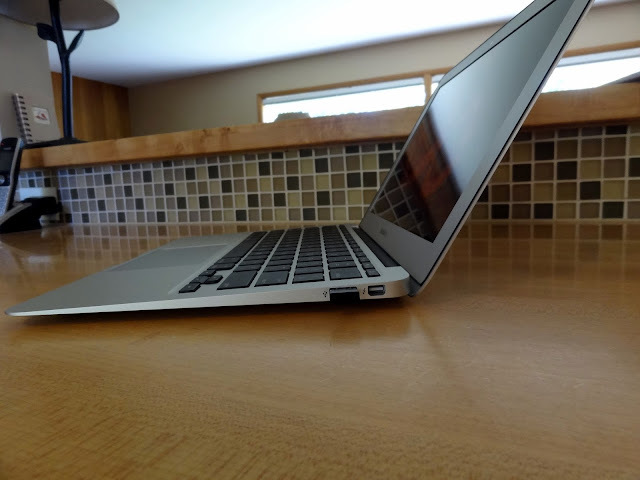 I'd heard about the new MacBook Air and thought it might be a perfect replacement. I thought being a die-hard PC fan from nearly the beginning of PC's (1980's) that this would be a very difficult decision for me. One look in the Apple store and I was sold. This little beauty only weighs 2 pounds and has an 11 inch screen, but is oh, so powerful. Check out how slim the profile is! I measured the back when the top is closed and it's only 3/8"! It didn't take me long to get used to the operating system, either. Having Mr. Squash's old iPad helped some, but even without that knowledge I would have been up and running in no time at all. I suspect in short order I'll be ditching all my other portable computer gadgets! On our way home we stopped at an orchard we've been wanting to visit. We came home with loads of apples and peaches. Let the baking begin! Your barn quilt is beautiful. I love the colors! The treeless apple is also pretty. I am sure you will have loads of fun with that one! what is the barn quilt made out of and what are the dimension? Love it! Sorry the weather wasn't nice for a day of fishing, but it looks like you had no trouble entertaining yourselves! Love your barn quilt! I'm going to go check out her Etsy shop. Have fun with your new Mac - have to say, I'm a PC girl and don't think that will change. 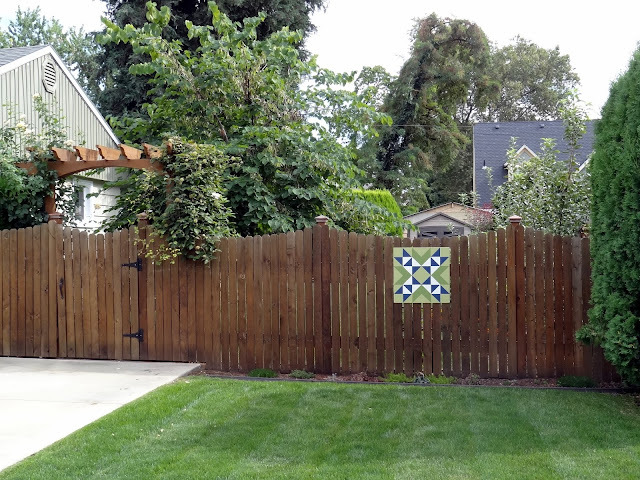 Yeah for quilts on the fence! Sorry the weather interrupted your fishing trip. I love your barn quilt! I think that's the prettiest one I've ever seen. Congrats on your new computer and that awesome barn block. Love it. Welcome home! I love your barn quilt...pretty block and the colors a perfect! We have always been PCs but we having slowly started migrating to the Dark Side ourselves. Started with iPods, iPhones, iPads and we gave my daughter a Mac Book Pro as part of her graduation gift. 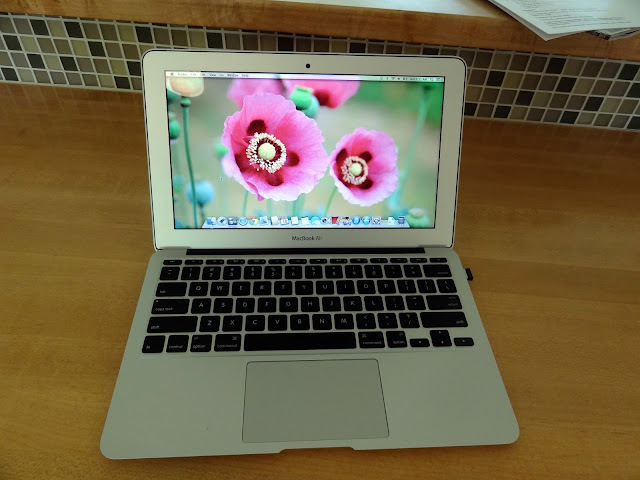 My husband's laptop just took a dive so he is thinking about replacing it with an Apple. No one I know, who is an Apple, has ever had the issues we've experienced as PCers. The barn quilt is beautiful and just the right size for the fence. Congratulations on your new apple! Ooh, is that what should be growing on my apple tree too? Love that barn quilt! I'll definitely be checking them out! 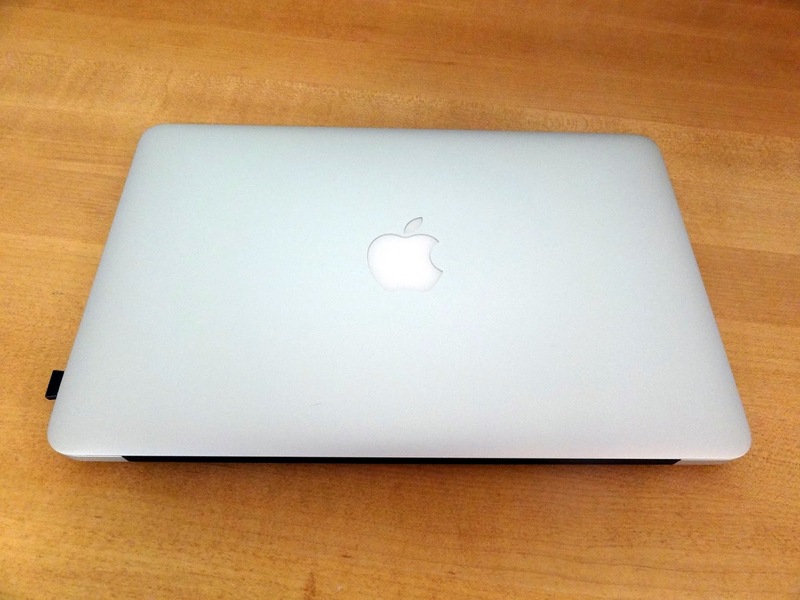 I switched to a Mac a year ago this month and haven't looked back since. No regrets and I love it. Happy baking and save some for me! Hugs to Gracie May and Sasha. Bet they were happy to see you both. Who says you need a barn for a gorgeous sign like that one! It says it all...quilter love! I love your barn quilt. I'm going over to visit Sherry's etsy shop. It really adds such a nice touch to your fence. The green just pops. Have fun playing with your treeless apple. However when the desserts are made let me know. I'll be over. 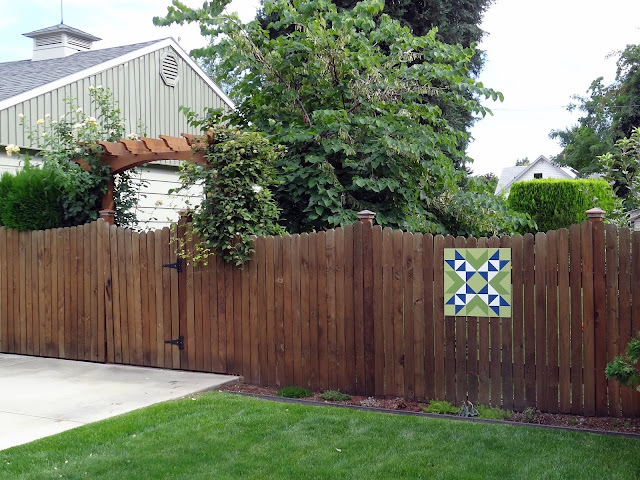 Your barn quilt looks wonderful in that spot, especially love that gree shade matching with your garden! Congrats on your treeless apple... hahaha.. so funny! Barn Quilt is AWESOME!!!!! I sooooooo LOOOOOVVVVEEEE it!!!! I am pretty sure I am going to have to get one too!! :-) We are totally an Apple family. So user friendly...especially for me. You will wonder what took you so long to switch. Enjoy, Candace! Oh, you fooled me with the treeless apple! Congrats :) I hope you enjoy the apples and peaches - maybe you'll make some Spiced Peach Preserves! Your barn quilt is a nice touch-what a great idea! I've wanted something like that to go on my back patio. Thanks for mentioning it.